The Avon Jupon is from the early 1500s Flanders, which was considered part of northern France. Today, it's Belgium. Lacing on each side of the bodice area makes it possible to feast to your heart's content and still easily fit this dress. Additional laces from the wrist to elbow provide a snug fit. 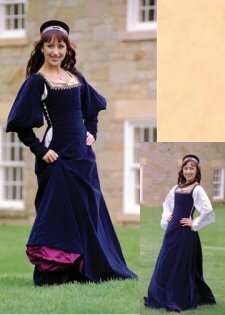 The detachable sleeves provide an option -- they can easily be interchanged with other colors in the same style to expand the look of your medieval wardrobe. The Avon Jupon cinches the waist and provides a lift for the bosom eliminating the need to wear a bra. The gown is designed to be warn with a chemise. It is made of 100% cotton velveteen and fully lined in contrasting satin. Recommended worn with the Classic Chemise. The chemise's extra sleeve fabric can be tucked into the top part of the gown's sleeves to make them fuller. Order your gown by your natural waist measurement.